Parfait dans l'intimité, emplacement, ses infrastructures. Pour 3 nuits, 4E NUIT EST GRATUIT! SEJOUR POUR 3 NUITS ET VOTRE NUIT 4ÈME EST GRATUIT! Offre pas valable les week-ends de vacances ou les vacances de mars / printemps ou octobre. Toute la maison pour le prix d'une suite! ..... Détendez-vous dans un luxe discret. À quelques minutes du centre-ville historique Eureka Springs, Arkansas, Dragonfly Montagne attend pour calme, détente, des jours et des nuits de rajeunissement. Situé sur 10 acres et plus, votre loge privée offre à ses clients un centre multimédia complet avec ordinateur et imprimante. Deux LCD de grandes télévisions pour un après-midi sur le canapé rembourré avec Netflix ou un DVD préféré. Dragonfly Montagne peut accueillir jusqu'à 4 adultes avec lits queen size. Un bain spacieuse avec baignoire et douche et deux lavabos. Une kitchenette avec vaisselle, four micro-ondes, d'un réfrigérateur et cafés et thés fait le petit déjeuner sur la terrasse couverte un jeu d'enfant. Un barbecue au propane sur le porche, il est facile d'avoir un barbecue. Dragonfly Montagne se trouve parmi une forêt de feuillus. La nature abonde. Cerfs visiter presque tous les jours et les lapins jouent dans la matinée de la cour et de la nuit. Grandes fenêtres permettent à découvert pour vous de profiter de tous les sites de la nature tout être isolée dans la forêt. La chambre ne dispose draperies en dentelle transparente. Profitez d'une étoile allumée la nuit. Étoiles sont lumineuses loin des lumières de la ville et ainsi semblent si proches que vous pourriez les toucher. Un lever de la lune sur la montagne est toujours un régal. Pour votre plaisir est une table de billard réglementation Olhausen - professionnel sur le site instruction de billard est disponible. Il y a aussi beaucoup de livres, des films et jouer aux cartes pour votre usage. Promenez-vous la propriété, photo nature ou tout simplement s'asseoir par l'un des étangs de Dragonfly. Plus de 10.000 gallons traversent les bassins en continu. Attraper le lever ou le coucher de soleil sur un étang de Koi nager sous. Dragonfly Mountain est une partie d'un établissement d'hébergement genre dans uniques Eureka Springs, AR. Près de l'agitation du centre-ville avec des antiquités, l'art, la musique et beaucoup de choix de restauration. Et à seulement quelques kilomètres de Beaver Lake et Table Rock Lake avec des centaines de miles de littoral. Pêche, navigation de plaisance sur les Ozarks premiers cours d'eau. Apportez votre canne à mouche et pêche à la truite sous Beaver Lake Dam. Passez quelques jours à explorer Eureka Springs, puis la tête hors de loisirs et sites remarquables tout au sein d'une heure de route. Visitez le nouveau Crystal Bridges Museum à Bentonville ou passer une journée qui serpente à travers les Ozarks à Branson et assister à un spectacle. Dragonfly Mountain est le choix parfait pour ceux qui souhaitent se reposer, se détendre et de renouveler dans un cadre magnifique avec tout le confort de la maison. goodies boulangerie frais vous attendent. Venez à la maison à Eureka Springs, venir à la maison Libellule Montagne. Appelez dès maintenant pour réserver. Grande salle de bain avec baignoire / douche et deux lavabos. Grand miroir et armoire à linge pleine de serviettes et d'autres fournitures de salle de bains, sèche-cheveux fourni. If you are looking for peace & quiet in the country, this is the place for you. We loved our little cabin in the woods. We sat on the pirch and watched the deer go by. Right next to the cabin is the owners menagerie. A horse, a donkey, a one eyed pony, 2 goats, 2 lambs & chickens. Bring apples & carrots and they will be your best friends. If you are planning on cooking there, the kitchen is very tiny, with no stove. We brought an electric skillet and used the grill. There are some utensils, but I would suggest bringing your own. We cooked breakfast & dinner there. There are NO curtains on the windows, except very sheer lace in the bedroom. If you are looking to sleep late, forget it. The sun comes in early and the chickens & birds are loud. There are people walking by to look at and feed animals, so you have to be careful about changing clothes. My husband & I love the country so it was great for us. If youbare looking for more excitement, stay in town. Eureka Springs is a quaint little town with so much to do and see. We were never bored. The cabin is clean, well cared for and just lovely. We spent alot of time on the porch with the goats. Yes, Ginger & Maryann make themselves at home but are friendly and well behaved. All in all, we had a great vacation and loved the cabin. We are hoping to go back someday and will definitely stay in the same place again. I highly recommend it. Have stayed in Eureka a few different times, this time we brought our 2 year old. Loved how short the drive was to downtown area, close to grocery store, gas station, liquor store, etc. It rained most of the time we were there which was a bummer but nice having the pool table and Netflix to help wait out the rain. Our 2 year old loved the animals so we visited them several times a day. Walking trails throughout we explored. Both queen beds are in the same room and kitchen was definitely smaller than anticipated. However, I was expecting this so brought an electric skillet and used the outdoor grill. Tough if you're doing a lot of cooking but ok for quick meals. Overall very nice and would stay again. My 18 year old son and I were spent a few days hiking and see the sights of Northwest Arkansas. Dragonfly cabin was in a great location, nestled in the woods, away from the crowds, but within a 7 minute drive of downtown Eureka Springs. The cabin was neat and clean with everything we needed to make us comfortable. There was a lot of room which is far superior to room at a Bed and Breakfast in town. We thoroughly enjoyed the animals- a donkey, two ponies, two goats and two baby lambs as well as chickens and a rooster. They are gentle and approachable so I would recommend bringing some apples and carrots to feed them. We had a great time! LOVED IT! CAN'T SAY ENOUGH GOOD! The Dragonfly was exactly what we were looking for. A quiet, mostly secluded place to just relax and unwind - peaceful and quiet. The cabin was amazing and everything was thought of. There were movies, books, a pool table - even an adult coloring book - which I enjoyed. We loved watching the deer in the yard every morning and evening too, listening to the birds, and hearing the calming water running into the small fish pond out front. It was too cold for us to sit on the porch for long, since we went in early February, but we took advantage of it a few times. Another plus for us - a good strong shower! We hate it when our lodging has a weak shower. All-in-all, everything was beautiful, easy to book, check in and out.... just perfect. 5 STARS, highly recommended, in fact... we may come back in the fall! Can’t help but relax. Accomaditions were wonderful. So close to all Euerka Springs has to offer. Jan was pleasant,helpful and accommodating. Private, attractive and comfortable cabin in the woods. We had a nice enjoyable stay at the Dragonfly Mountain Lodge. 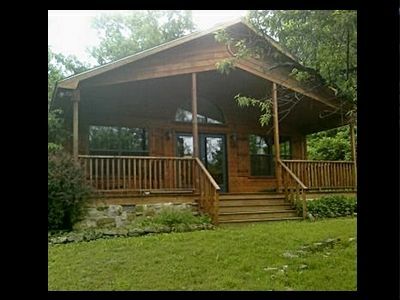 The cabin is very private but easily accessible by a winding road from Eureka Springs. Our bed was very comfortable. There are two large screen TVs. I particularly enjoyed the professional model pool table, nice cues and plenty of space around it. The kitchenette was fine although there was no cook top. The front porch was nice with seating and a grill (it was a little cool for cooking out). The owners have two friendly dogs and a one eyed pony, a donkey, and two goats. The cabin was stocked with animal crackers for feeding the animals and share with the humans. We strongly recommend dining at the Fresh Flavor Restaurant in Eureka Springs. Taking the 90 minute area tram ride for $15 is interesting, amusing and great value for checking out the Springs area. We had a great stay and hope to return to the Dragonfly in the future.